Almotamar.net, Saba - Assistant Secretary of the U.S. Treasury for International Affairs Andy Baukol said on Saturday that his country strongly supports the establishment of an international fund to support Yemen economically and developmentally. 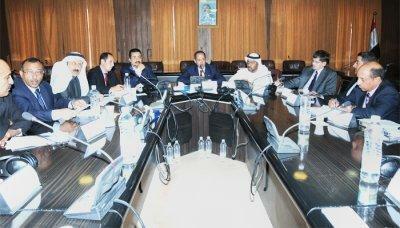 Baukol reiterated his country's keenness to provide all aspect of possible support for Yemen. This came during an expanded meeting gathered Minister of Planning and International Cooperation Abdul Karim al-Arhabi and representatives of donor States and organizations to Yemen, in which they reviewed the components of the five-year plan (2011-2015) for socioeconomic development and poverty alleviation and its investment program. At the meeting, al-Arhabi pointed to the more active role should be played by donors in helping Yemen to overcome the major challenges facing the development and stability in Yemen, noting the current trends of donors to establish a trust fund for supporting Yemen. Establishing this fund and to be devoted to finance infrastructure projects in Yemen would be a new mechanism to support the components of development in Yemen, al-Arhabi pointed out. He reviewed the challenges facing the country at the economic level and the achievements made by Yemen in applying the national agenda for reforms, expressing the Yemeni government's appreciation for donors' understanding of the nature of these challenges. In his turn, Minister of Finance Nu'aman al-Suhaybi reviewed the financial challenges that face Yemen, noting that the decline in production and prices of oil, which represents the main source of the Yemeni national income, has led to the State budget deficit. The fund to be established by donors should get effective support from all development partners of Yemen and should have flexible mechanisms to contribute to achieve its objectives, he noted. Moreover, a number of representatives of donors presented during the meeting interventions on issues related to the promotion of cooperation between Yemen and donors.